"Regions Reimagined," the theme for this year's Smithsonian Food History Weekend, will explore the power of place and the dynamics of change in American regional foodways. This post by Curator Paula Johnson takes us to a maritime community that will be represented in a cooking demonstration at the museum on Saturday, November 3. Sprawling 12 miles offshore from Crisfield on Maryland's lower Eastern Shore, Smith Island is a series of low-lying, marshy landmasses in the Chesapeake Bay. Unless you have your own boat, getting to the island requires a trip by ferry across the waters of Tangier Sound. When the sound is "dish ca'm" (an expression islanders use to mean "smooth as a dish"), the voyage allows for birdwatching and contemplation. But when the waters are riled by "weather," the choppy, rolling passage tends to focus a mainlander’s mind on survival. For island residents accustomed to whatever the bay hands out, a rough passage goes without notice. 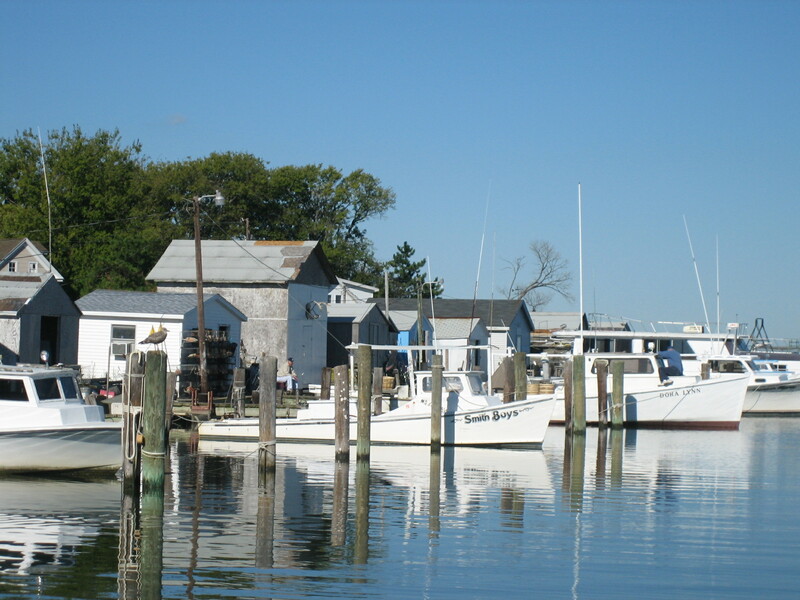 The harbor with workboats at Ewell, Smith Island, on a calm day in October 2006. Photos in this post are by author unless otherwise noted. As descendants of settlers from Cornwall, England, who came to the island in the 17th century, Smith Islanders possess a depth of knowledge about the bay that infuses all aspects of their work and community life. Since the 19th century, as markets and transportation networks were established for local seafood, Smith Islanders have "followed the water" as commercial watermen, harvesting the seasonal round of seafood—blue crabs (Callinectes sapidus) in summer and oysters (Crassostrea virginica) in winter. In the 20th century, as the bay's fisheries declined due to widespread loss of habitat, disease, pollution, and increased harvesting competition, the number of watermen able to make a living, and the population of the island itself, also declined. The U.S. Census reported 777 residents of Smith Island in 1930; 453 in 1990; and only 276 people living in the island's three communities of Ewell, Tylerton, and Rhodes Point in 2010. 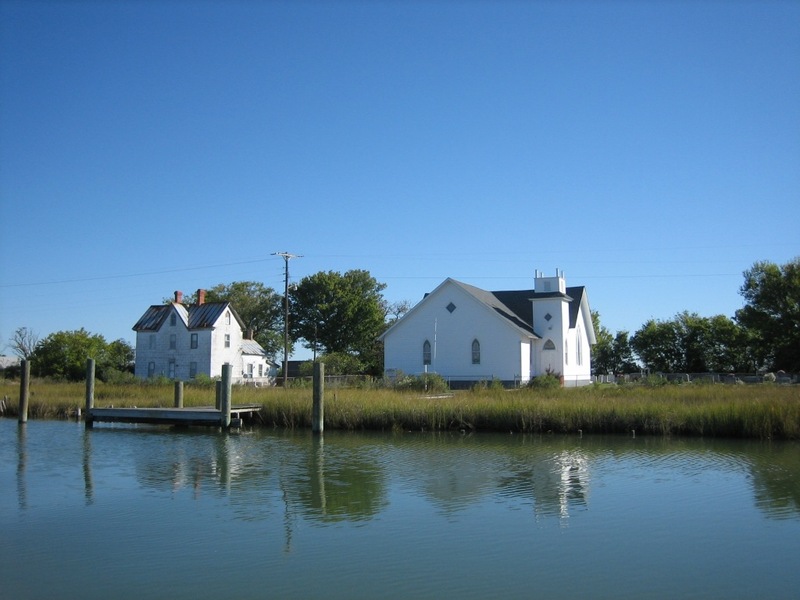 I began traveling to Smith Island in the 1980s as part of a research project organized by the Maryland Historical Trust's folklorist Elaine Eff. Elaine and I made regular trips to conduct oral history interviews and work with islanders to create the Smith Island Visitor's Center. 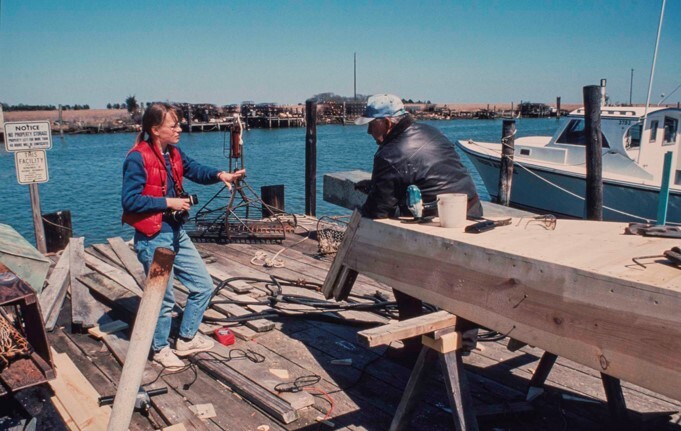 While my main interest was documenting the designs and construction techniques of the island's working watercraft for my book, The Workboats of Smith Island (1997), I was also drawn to the expressive dimensions of island life, including traditional foodways and storytelling. Boats, food, and stories all embodied and reflected the islanders' deep sense of place and identity. Interviewing boatbuilder Haynie Marshall in Tylerton, 1994. Photo by David A. Taylor. Against this backdrop of a maritime community in transition (or "an island out of time," as Tom Horton referred to it in his 1996 book by the same name), we're looking forward to welcoming Smith Island native Janice Marshall to the 2018 Food History Weekend stage. 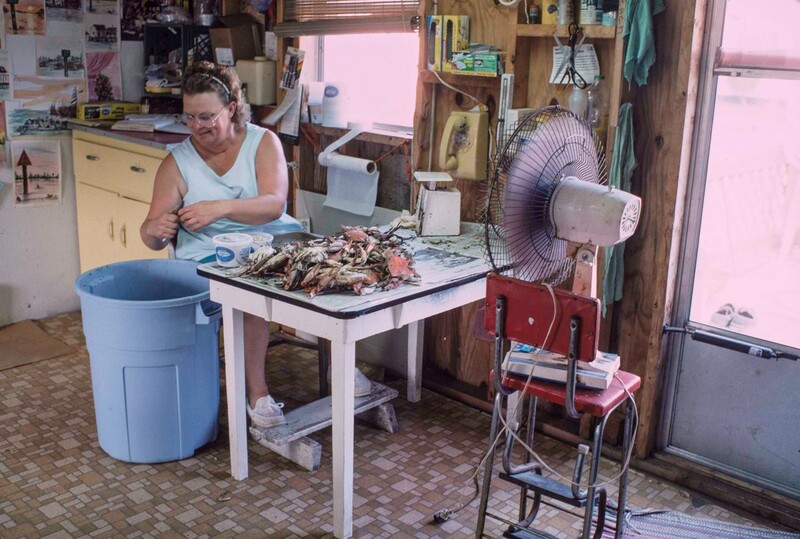 Marshall, whose family extends back six generations on the island, is a storyteller, songwriter, home cook, expert crab-picker, and businesswoman. Like many island wives, she was an essential partner with her husband in the "water business." Janice Marshall picking crabmeat at home several years before she established the Crabmeat Co-op at Tylerton, Smith Island, in 1996. 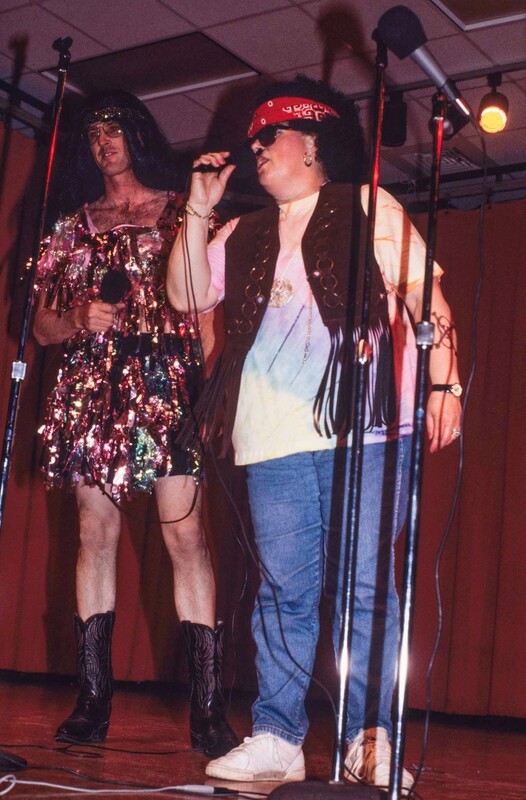 Janice Marshall performing a song and skit with other Smith Islanders for a charity event. On Saturday, November 3, Marshall will be sharing two recipes in a cooking demonstration on the museum's stage: oyster pie and 10-layer cake (recipes will be posted online). Oyster pie is a winter dish, traditionally made and served at home. Marshall will prepare this easy-to-make comfort food that her husband, Bobby, would look forward to and then devour after a long, cold day of oystering on the water. 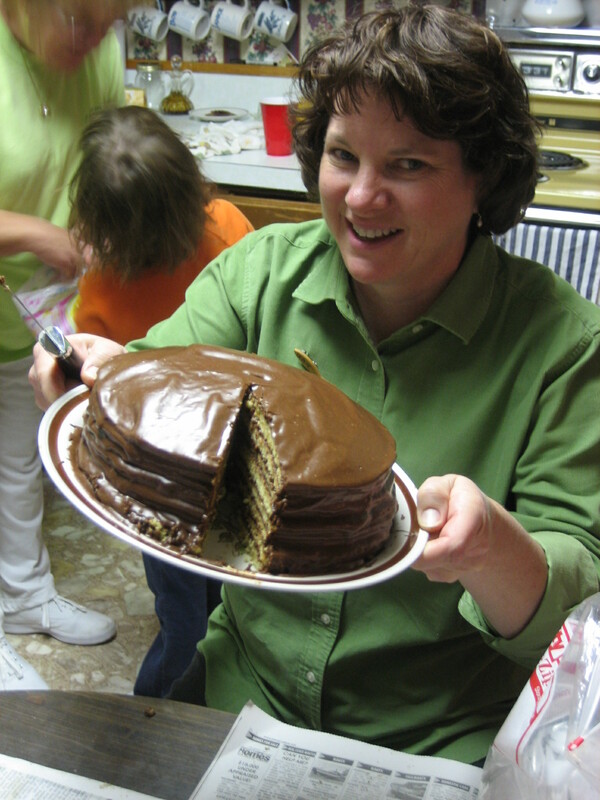 Janice Marshall making a Smith Island layer cake in her home kitchen. Smithsonian staffer Nanci Edwards holding the finished masterpiece, 2006. A Smith Island cake. Photo courtesy of Edwin Remsberg. Ten-layer Smith Island cake is the opposite of comfort food served at home: it's meant to be seen and appreciated by mainlanders and islanders alike. 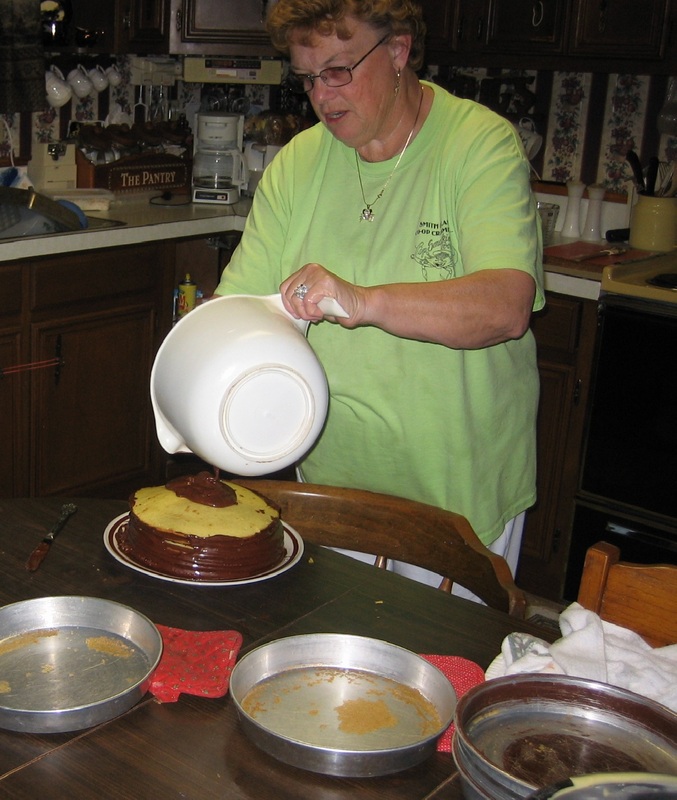 The women of Smith Island are known for creating multilayered cakes for church suppers, fundraisers, and other community events. 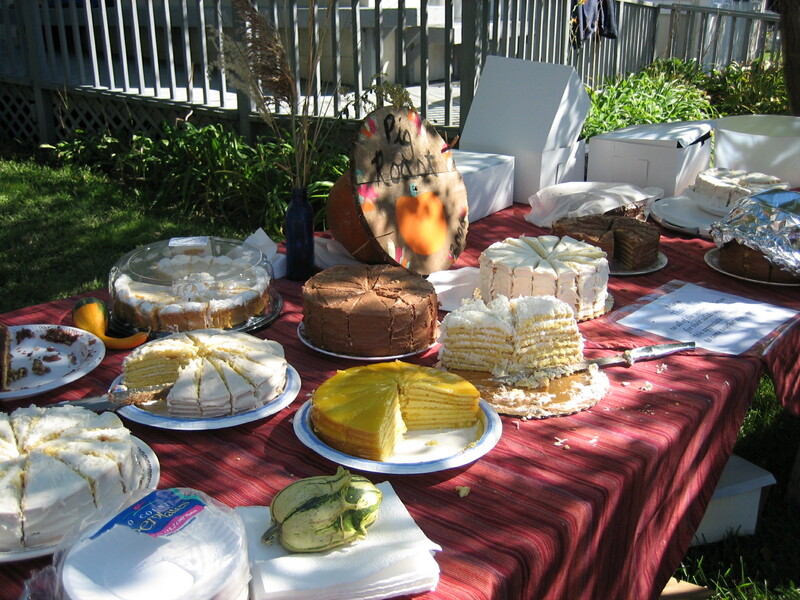 After gaining attention over the years, in 2006, Smith Island cake was named the official dessert of Maryland. While Marshall won't have time to make and frost all 10 layers during the demo, she will bring her cake pans and will put the finishing touches on a cake from home. She'll share her tricks for making, assembling, and frosting this fancy, sweet dessert that emerged from a salty maritime community on the Chesapeake Bay. 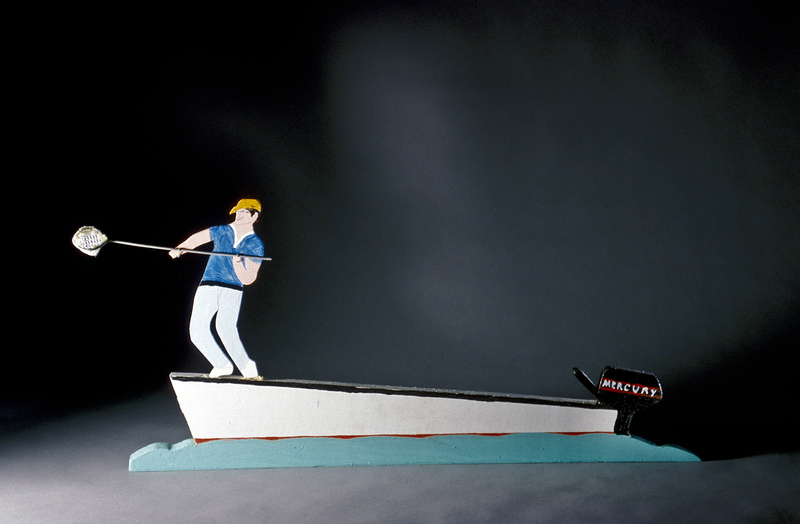 Figure of a waterman dip-netting for soft crabs made by Smith Islander Waverly Evans, 1996, in the museum's collection. Our Smithsonian Food History Weekend takes place from November 1-3 and includes cooking demonstrations, roundtable discussions, a black-tie gala, the Last Call event on beer history, and more. We recommend completing our free registration for the roundtables soon as these sessions are very popular. Last Call tickets are now on sale. Sign up for our monthly newsletter for more details.